A straightforward, quick cranberry orange breakfast muffins recipe that’s crumbly, moist, and jam packed with tart dried cranberries and zesty orange juice. 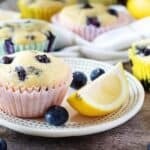 Breakfast muffins are easy to prepare and delicious to eat. Whether you like them savory or sweet, having a small meal in the palm of your hand is perfect for our fast-paced society. After returning home from a long trip, Kim and I were in recipe development for a couple of days. As a result, we didn’t have a lot of time for breakfast. While it might be the most important meal of the day, it’s also the easiest one to skip. I believe it was last Saturday when Kim and I turned to each other and said the same thing. “I want a breakfast muffin,” we exclaimed to each other. After a small chuckle, I got started. I used to make a lemon-raspberry wheat muffin ages ago when I felt like spending all morning in the kitchen. This recipe is a simplified version of that baked good. Now, I still wanted to make it homemade since it’s such an effortless endeavor. For this breakfast muffin, I substituted dried, sweetened cranberries for the raspberries and white flour for wheat flour. It’s not as “healthy” as my lemon-raspberry muffin, but it’s also not as dry either. In fact, this one will literally crumble in your mouth. However, it still manages to be moist, which sounds strange, I know. As you can see from the photos, the breakfast muffins didn’t rise all that much. Which, is fine with me but you may want to consider adding some sour cream or a little more baking powder to the batter. Also, I used pre-cut cranberries so there would be a little cranberry in each bite. On the other hand, you may want to try whole cranberries to see how that turns out for you. All in all, I am pleased with this cranberry orange breakfast muffin recipe. Kim and I were on the fence about putting it on the blog because of how it looked. But, we felt it would be good to show that not every recipe comes out looking like a magazine shoot and that’s okay. What matters is that you enjoyed cooking it and loved eating the meal. This is even truer when you are preparing something for someone you love. While my breakfast muffins would never make it into Cooking Light Magazine, I do hope they find a way to your kitchen. If you and your family like them as much as Kim and my son, then I would say it’s a “win-win” for everyone involved. In closing, I wish you a long, healthy life, everlasting love, and a tummy full of warm treats! A straightforward, quick cranberry orange breakfast muffins recipe that's crumbly, moist, and jam packed with tart dried cranberries and zesty orange juice. First, remove the butter from your fridge to soften or soften slightly in the microwave. Next, preheat your oven to 350 degrees F.
Afterward, in a stand mixer or using a large mixing bowl and hand mixer, stir together the flour, baking powder, baking soda, and salt. Then, add the sugar, butter, egg, milk, orange juice, and vanilla to the dry mixture and blend everything together until the batter is well-mixed. After that, fold the orange zest and dried cranberries into the muffin mixture. Now that you have all the ingredients combined take a cupcake pan and fill it with cupcake liners and muffin batter. However, you will only want to add enough of the mix to fill the liners to 2/3 full. Place the pan into your preheated oven and let the muffins cook for 20 to 30 minutes or until they are done. Last, remove the muffins from the oven and set them on a cooling rack to cool off a little before serving them. The calorie count listed is an approximation based on the ingredients, and the actual calorie count may vary slightly. The breakfast muffins can be stored on your counter in a sealed container for up to three days. Sounds good! I love using cranberries in muffins. Though I’ve kind of gone away from stocking orange juice in the house…. They look great! Thanks for sharing. Cranberry orange is my husband’s favorite kind of muffin. I think he is going to be super excited when I make these for him. I do enjoy sweet muffins. Not only do I like the taste, I love the smell while they’re baking in the oven. Cranberry orange muffins are my favorites! I would eat them everyday if I could. These sound very good and easy! This is coming at the perfect time! Schools about to start again and I know I will be running around like crazy. I need a grab and go breakfast. I can’t wait to try these. These look so good. I would love to try these sometime for breakfast on the go, I bet even my picky daughter would enjoy these! Now this sounds like an absolutely delicious way to start the day – I am all for a nice muffin for breakfast YUM! I like this combination, definitely going to try it. Yum. I’m not much of a baker, but these look and sound delicious. I love any baked gods with cranberries. Yummm cranberry orange breakfast muffins, how different! I am so used to eating just cranberry but I bet the orange adds a nice flavor. Will need to try! They look good that you could eat them more than just breakfast. I am trying to cut back on carbs though so I think coconut flour would be okay to substitute. They may not be magazine perfect, but these muffins look good to me. I love using sweetened dried cranberries in breakfast baked goods. Oh now these look super yummy and flavorful! 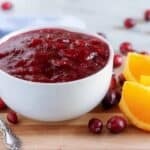 I love the flavor combo of cranberry & orange, one of my favorites! This looks like an awesome combination. Cranberries and orange in a muffin sounds good to me. I will try my hand in making these muffins. I will make a large batch and take some for my mom. This cranberry orange muffin recipe sounds delicious. We usually make ours starting in the fall, which can’t here soon enough. Thank you for sharing this great recipe. I like the combination of cranberry and orange, sounds really tasty. Its been a few months since I baked and now feel lie doing it.